We have some very exciting presents for you to celebrate our first Birthday! Dust off your dance shoes, it’s time to honour Georgina’s ancestors and the luck of the Irish! In September and October, 2015 the Global Irish Dance Phenomenon Returns to Australia and we have tickets for MICHAEL FLATLEY’S LORD OF THE DANCE: DANGEROUS GAMES! Competition closes 5pm AEST Saturday 22 August 2015. Winners will be announced shortly thereafter. The winner will be drawn 22/08/15 5.30pm AEST and announced on this website. The winner will also be contacted via email. 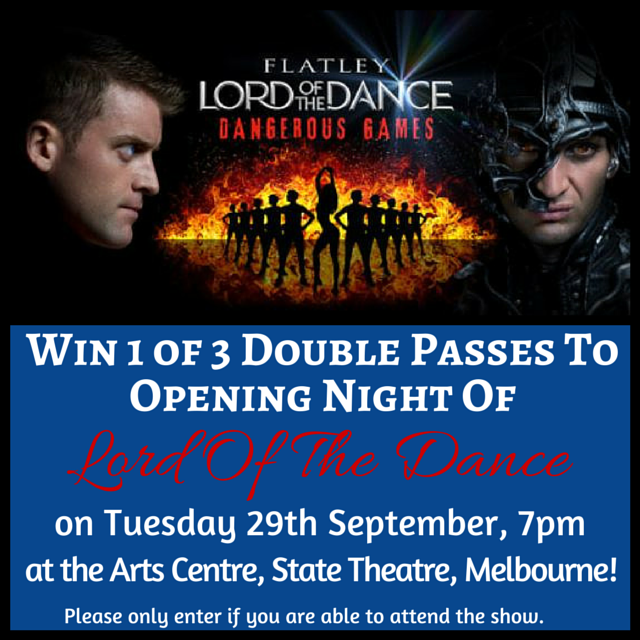 There are three (3) prizes each consisting of two (2) tickets to Lord of The Dance : Dangerous Games on Tuesday 29th September, 7pm performance at the Arts Centre, State Theatre Melbourne. They are valued at $89.90/ticket, so $179.80/double pass.